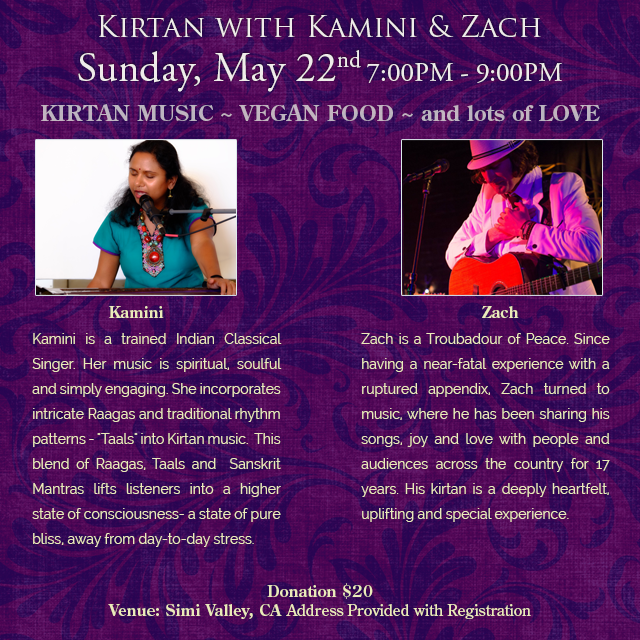 Kirtan with KAMINI AND ZACH! We have a Special Kirtan with a Very Special Kirtan singer ZACH who has been touring and performing Kirtans across the country! Zach is a Troubadour of Peace. Since having a near-fatal experience with a ruptured appendix, Zach turned to music, where he has been sharing his songs, joy and love with people and audiences across the country for 17 years. His kirtan is a deeply heartfelt, uplifting and special experience. We will serve vegan dinner and you are all welcome to bring a vegan dish to share as well.